So the day finally came around. 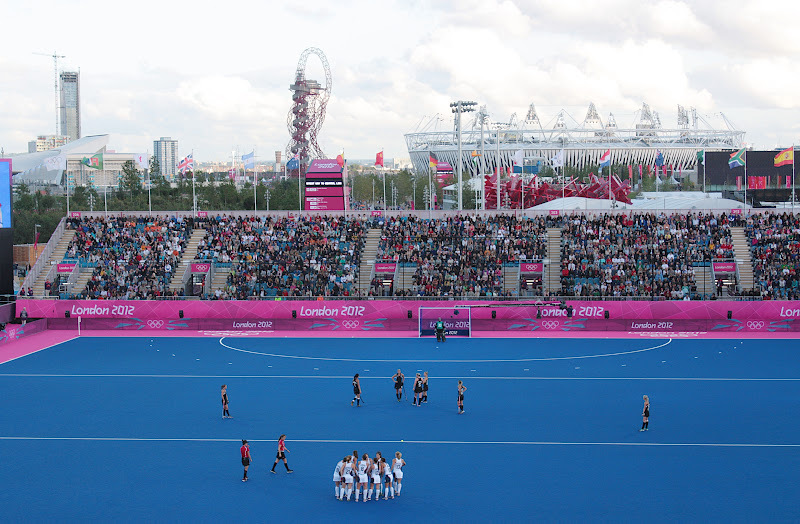 We got tickets to see womens' hockey on 4th August in the 2nd round of ticket applications back in June 2011. 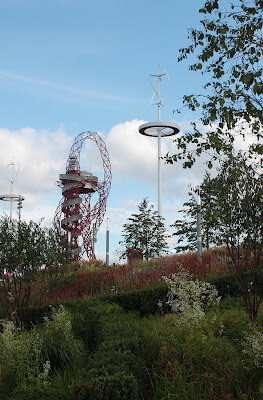 I then booked to go up The Orbit (see below), so we decided to make a day of it. It turned out to be 'Super Saturday' when Team GB won a record 6 Gold Medals! Despite all the hype, our journey out to the park was easy and not very busy at all. I was expecting hoards of people and vast queues. No so. 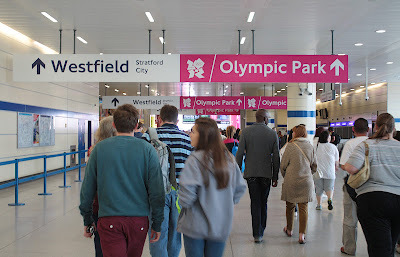 What made me laugh a lot when we arrived at Stratford station was the size of the Olympic signage and the number of 'Games Makers' who were there to direct us to the park entrance. There were loads of them. 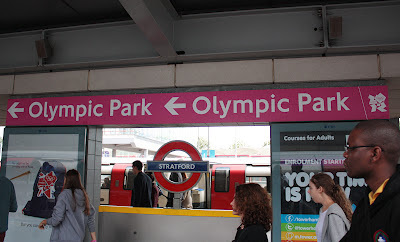 I had a real urge to go up to one and ask 'Sorry, I'm confused, where exactly is the Olympic Park?' I mean you couldn't miss that place if you tried! 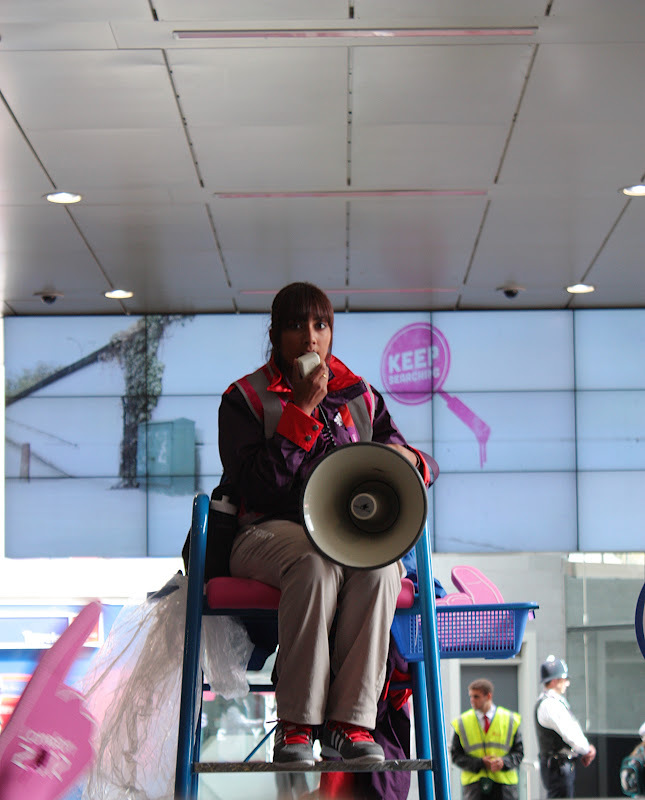 Metre high signs and pink foam fingers pointed the way, ALL the way! It was a bit of a step and a hop to the main entrance, but we were flanked all the way by the cheery Games Makers chatting and shouting to us as we passed: 'Welcome to the Olympic Games you lucky, lucky, lucky people!' was my favourite quote of the day. A bit of queuing, a bit of airport-style security, but then we were in! 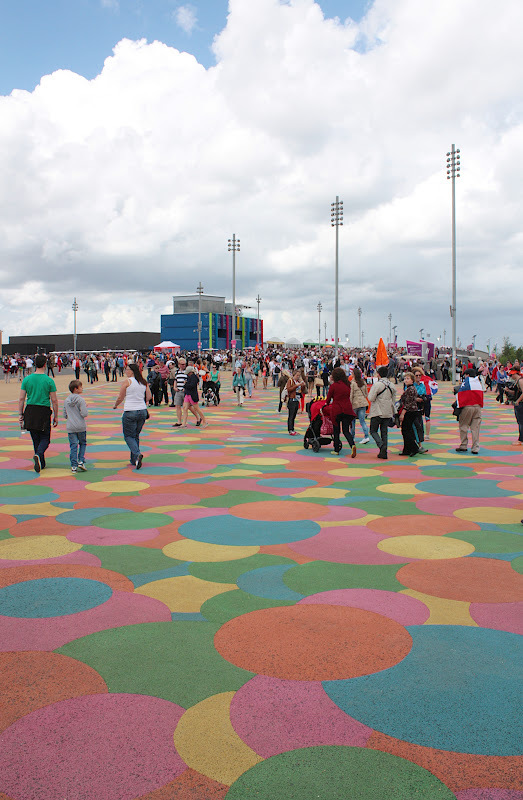 We were at the Olympic Games!! It was so exciting! Mr DI-in-law, Mr DI and another compatriot. And that place was massive, let me tell you! Lots of people, but a great atmosphere, everyone excited and interested in looking around the park before and after their ticketed events. A bit of local colour - we saw A LOT of union jacks! Did I mention we were at the Olympic Games?! Here we are AT THE OLYMPICS - woo hoo!!! We spent the morning walking the length of the park, looking at the venues and soaking up the atmosphere. 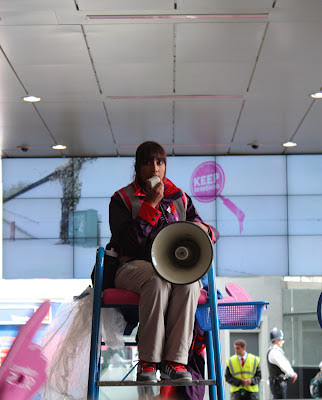 I also thought the 'Treat Stops' were a nice touch! ﻿﻿﻿﻿A picnic lunch (we took our own to avoid the queues for food, which turned out to be a wise decision), and then a bit of a rest watching live sport on the big screen. Such fun to hear the periodic roars and cheers from venues all around the park. 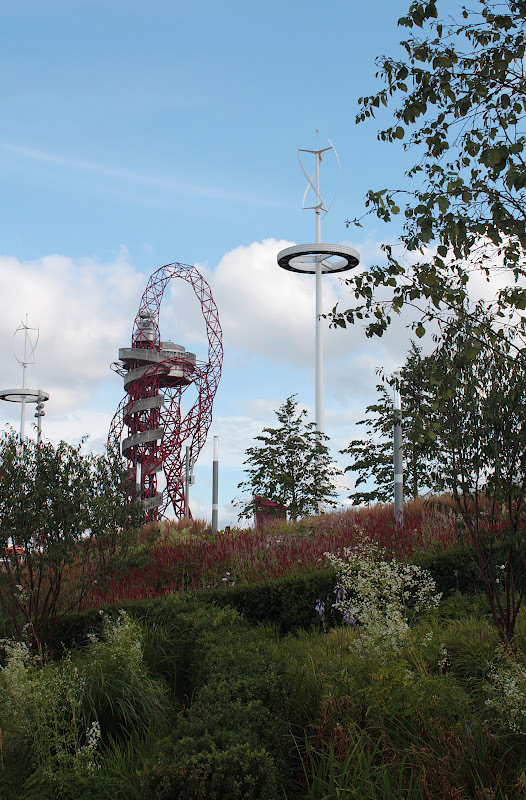 Standing 115 metres high, the Orbit is now the tallest art structure in Britain. It was designed by Indian-born British sculptor Anish Kapoor. You take a lift to the top and then you can walk back down if you prefer, which we did. It took 18 months to build, with 60% of its 2,000 tonnes of steel coming from recycled sources. At the top you get superb views of London of up to 20 miles. Inside there are 2 concave mirrors, also designed by Kapoor, which give unusual views of visitors and reflect the views back into the space. Mmm - not too sure this is the most flattering reflection of me! A bit of vertigo going on here! 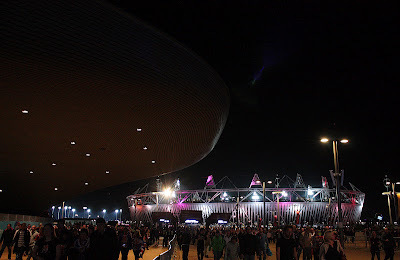 Yey - finally a peak into the stadium! But this was the view that amazed me most - just look at all those people!! 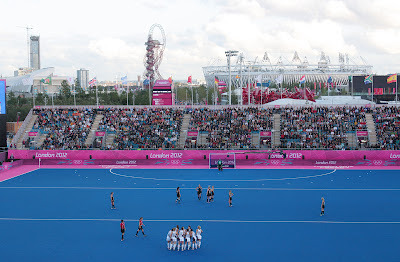 And then finally, after coming down from the Orbit, we made our way to the Riverbank Stadium (top right of the above picture) for the hockey matches. We saw USA vs New Zealand (winners) and Germany vs Argentina (winners). I'd never been to a sports match at a stadium before so it was an interesting experience for me - loved the Mexican wave! We had a conversation between matches about where that term comes from - in Colombia they just say 'wave', nothing Mexican about it. And then suddenly it was all over and time to head home...what an incredible day! Didn't feel much like running by this time of the night! We were there - oh yes we were! !